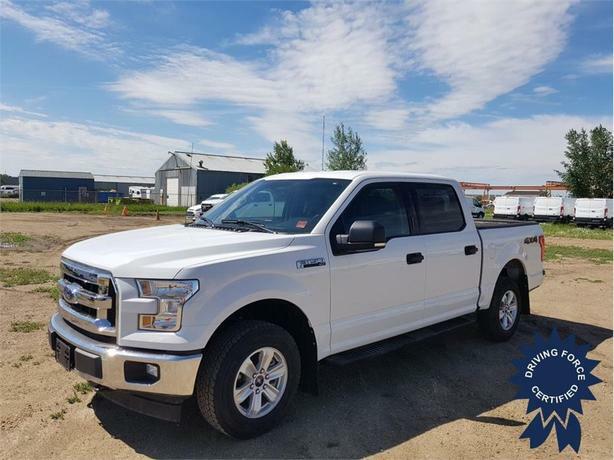 This 2017 Ford F-150 XLT Supercrew 6 Passenger 4X4 truck comes with a 5.5-foot shortbox, electronic 6-speed automatic transmission, electronic-locking with 3.73 axle ratio, 17-inch silver wheels, monotone paint application, cloth 40/20/40 front seat, trailer tow package, Class IV trailer hitch receiver, integrated trailer brake controller, skid plates, dual power class/manual folding heater mirrors, rear window fixed privacy glass, rear window defroster, black platform running boards, remote start system, black vinyl floor covering, reverse sensing system, rear view camera with dynamic hitch assist, Pro Trailer Backup Assist, part-time four-wheel drive, block heater, 200-amp alternator, towing with harness and trailer sway control, 1570# Maximum Payload, gas-pressurized shock absorbers, front anti-roll bar, electric power-assist speed-sensing steering, single stainless steel exhaust, auto locking hubs, double wishbone front suspension with coil springs, lead rear suspension with leaf springs, chrome rear step bumper, chrome front bumper with body-colored rub strop/fascia accent and two tow hooks, black door handles, deep tinted glass, aluminum panels, chrome grille, tailgate rear cargo access, front fog lamps, power windows, compass, keypad, remote keyless entry, cruise control with steering wheel controls, manual air-conditioning, HVAC underseat ducts, glove box, day-night rearview mirror, three 12V DC power outlets, fade-to-off interior lighting, front and rear map lights, pickup cargo box lights, and 5.0-litre V8 gas engine delivering 385 horsepower at 5750 RPM and 387 lb-ft of torque at 3850 RPM. The GVWR rating is 7,000 lbs (3,175 kgs). Email us for more information about this unit or to schedule a test drive. If you need financing, let us know. We have a dedicated team of professionals to help you with a plan to purchase this truck.